The “Great Recession” was evidently so bad for the economy that it stopped the net influx of illegal immigrants from Mexico. 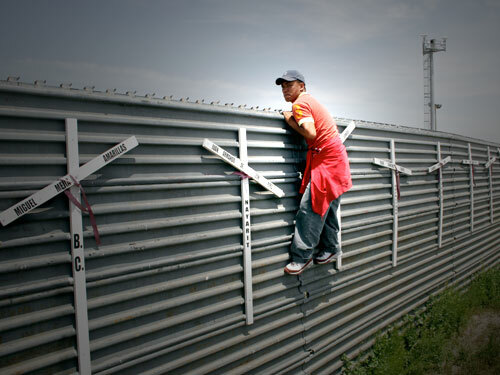 Pew Hispanic found that, according to official numbers, more than 800,000 undocumented workers came to the United States during 2009-2014 while more than 1 million fled the U.S. during the same period. It seems that employment became more difficult after the 2008 economic crisis, while Mexico’s economy actually improved. Apparently there are so few good jobs that many Mexican migrants – including both those that are legal and illegal – departed or stop coming in and turned instead to work in their home country where they can also be with family. From 2009 to 2014, 1 million Mexicans and their families (including U.S.-born children) left the U.S. for Mexico, according to data from the 2014 Mexican National Survey of Demographic Dynamics (ENADID). 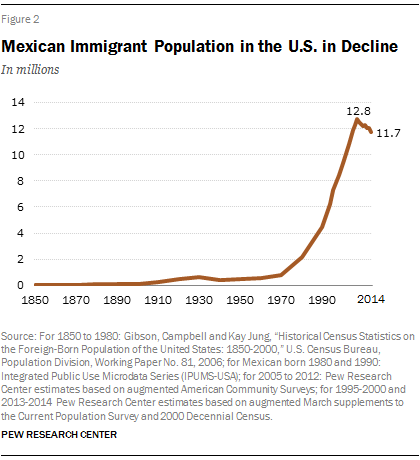 U.S. census data for the same period show an estimated 870,000 Mexican nationals left Mexico to come to the U.S., a smaller number than the flow of families from the U.S. to Mexico. Mexico is the largest birth country among the U.S. foreign-born population – 28% of all U.S. immigrants came from there in 2013. Mexico also is the largest source of U.S. unauthorized immigrants. A majority of the 1 million who left the U.S. for Mexico between 2009 and 2014 left of their own accord, according to the Mexican government’s ENADID survey data. While it is true that many immigrants are not officially counted and many estimates put the number of undocumented workers much higher than 12 or 13 million, that number is declining for the first time since the 1970s. But the celebration of a historic turning of the tide for one of the most contentious issues in American politics may also herald the tough times ahead for Americans and everyone else working here, regardless of status. The jobs have essentially dried up, and things stand to get even worse if/when the next economic bomb drops. And that could be any day now. The writing is on the wall, the system is on edge, and something as simple as a Federal Reserve rate hike could mean financial desperation for millions upon millions of Americans. But with the receding tide of immigrants from south of the border may come larger and larger numbers of immigrants from China and India, as well as Islamic countries, including many technically skilled workers here on H-1B visas who are replacing American jobs. The reversal of Mexican migration doesn’t mean that the United States is seeing fewer immigrants overall, just that their countries of origin are changing. 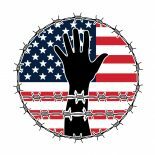 The United States has seen a record number of Central Americans fleeing violence in the past few years, straining the country’s ability to process their requests for asylum. In addition, Lopez said, immigrants from China, India and other Asian nations are coming as students and high-tech workers. Eventually, Asians will become the dominant share of the immigrant population, he added. Though they claim to have now reversed their decision, Disney recently came under fire for decision to layoff all of its American workers – including those with decades of experience – and replace them with cheaper (but equally skilled) IT workers from India. The move, cancelled or not, is a sign of the times for a situation that may become more desperate and gloomy with each passing year for native American workers who once assumed relative wealth among the middle class, but are now fighting for survival. President Obama, for his part, has over-extended – well, abused really – his executive authority to grant amnesty to millions of illegal immigrants from Mexico, but they too may soon prefer their country of origin – particularly if the coming financial implosion hits worst in the United States. This entry was posted on November 22, 2015 by conspiracyanalyst in Economic Warfare, Illegal Immigration, Jobs, Society, US News and tagged illegal immigration, jobs.